Mind-bending sounds from four polyphonic pitch effects and two independent voices. 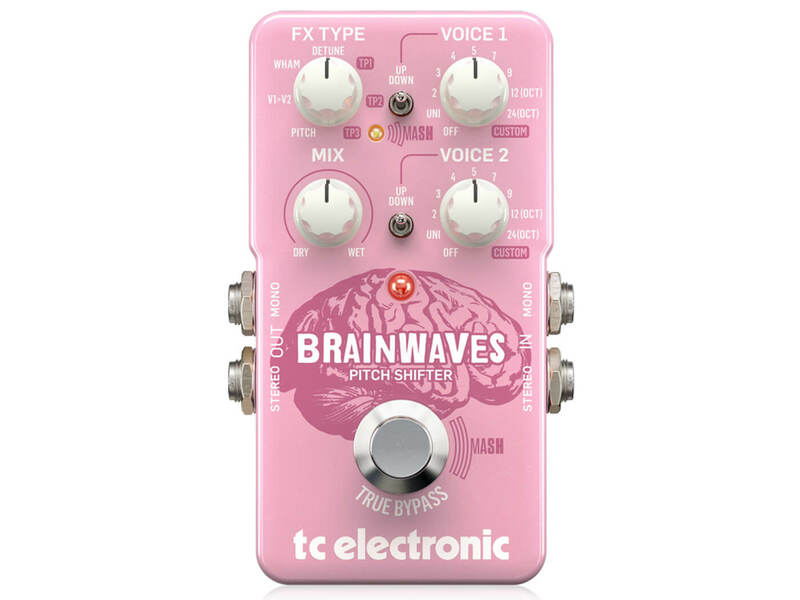 TC Electronic has launched the Brainwaves Pitch Shifter, a modulation unit with two independent voices, four polyphonic pitch effects and an innovative MASH footswitch. At the heart of the pedal are four pitch effects: Pitch, Wham, Detune, and V1>V2. In Pitch mode, you can add up to two additional voices to your signal. These voices can be independently tweaked via two knobs: Voice 1 and 2. Each voice control also comes with an individual up/down switch, enabling you to set the pitch effect to either above or below the original signal. If you want an effect with a sonic punch, the Wham mode is a perfect option. Like Pitch, Wham is shaped via the two voice controls, which can be tweaked for a sweet pitch effect or a two-octave, dive bomb explosion. Elsewhere, the stompbox features Detune and V1>V2 pitch effects. The former gives you a chorus-like sound that pairs well with complex chord voicings, while the latter combines the pitch shifter and whammy, and lets you bend Voice 1 to Voice 2. The pedal also boasts TC Electronic’s pressure-sensitive MASH footswitch. Like an expression pedal, you can step on this footswitch for a moment to bend pitch-shifted notes – this effect varies with each parameter. Rounding out the pedal’s features are a Mix knob – that sets the wet/dry blend – as well as three TonePrint slots that can be configured via the TonePrint app. The latter gives you access to signature effects from some of your favourite artists.